Well, I’m behind on everything else this Christmas, so why not my tags too! 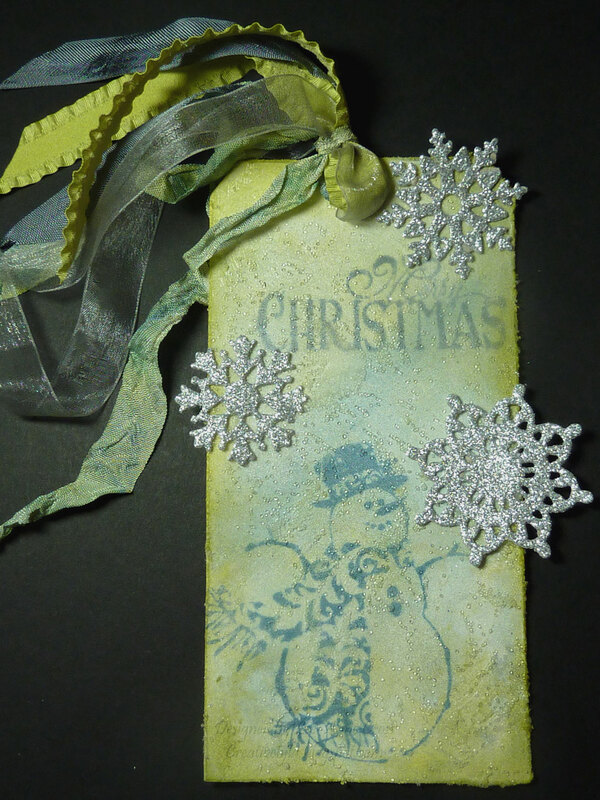 Here is Tim’s fourth tag.I kept the snowman theme but tried to play a little with some different products. Again, the picture just does not show how sparkly the entire card is. Must work on my photography skills! First, I smeared Shabby Shutters, Weathered Wood and Stormy Sky Distress Inks on my non-stick craft mat, then spritzed it with water and pulled my card stock through it. Then, I cut the tag with the Tag and Bookplates die. The snowman and sentiment were stamped in Stormy Sky and then I used a paint brush to cover the entire tag with Golden Glass Bead Gel. Once that was dry, I inked the tag with Versamark and heat embossed with Antiquities Frosted Crystal embossing powder. Then I repeated the Versamark and heat embossing. It gives a more pronounced look to the Glass Bead Gel. The edges of the tag were distressed and sponged with Shabby Shutters. Next, I used my Stampin’ Up! Northern Frost Sizzlets Decorative Strip die to cut some snowflakes out of silver glitter paper. The paper is quite thick, so shims were needed to get a proper cut and I actually had to use my craft pick to finish poking through some of the holes. These snowflakes were then glued to the card with Crafters Pick Glue. I hand dyed some seam binding with the Shabby Shutters and Stormy Sky Distress Inks and then pulled some other ribbons from my stash as the final embellishment for the tag. Hope you are enjoying these tags as much as I am! I had to look at this one a long time, Lee-Anne. It has such a great depth from how you inked the bg and those sparkly bits and pieces. Love your snowflakes…so much detail…they almost look like crochet trim. And the seam binding…I must do this. Love those sparkly snowflakes and wonderful ribbons! The colors on this are GORGEOUS! !